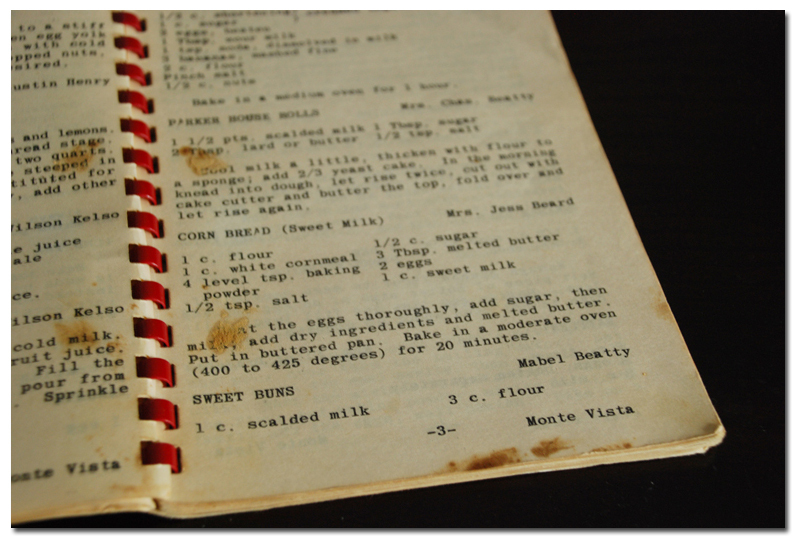 Notice the years of cooking stains, the worn edges of the pages, binding that is slowly coming loose. 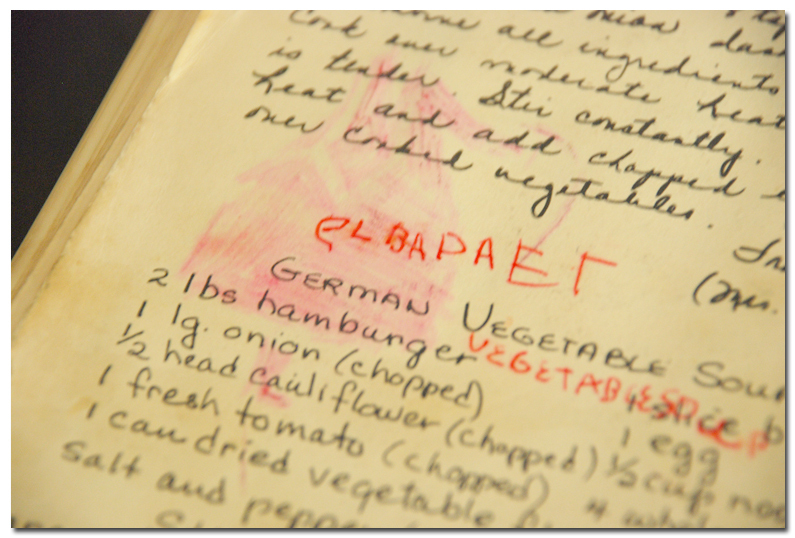 This war-torn tome is my grandmother’s favorite cookbook. No, it’s not Betty Crocker, nor is it Better Homes and Gardens, though she has both of those in her collection. 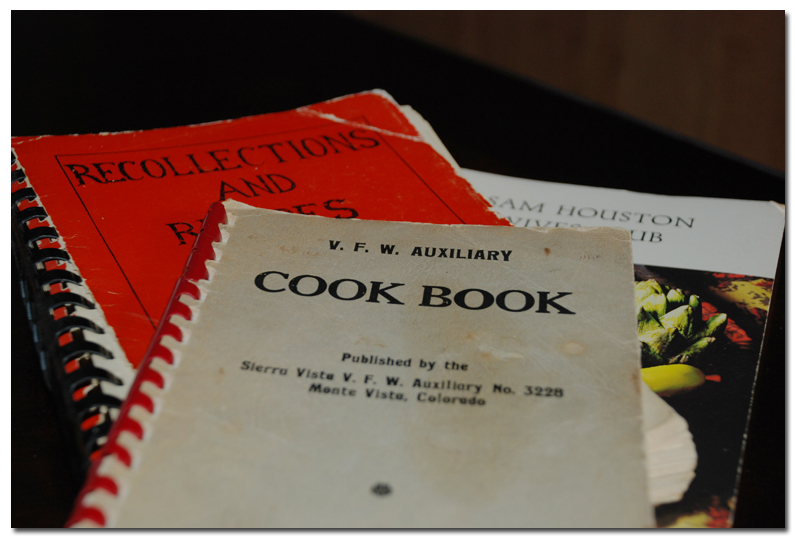 This particular cookbook is “Recollections and Recipes From Army Wives: The Museum Cookbook”, compiled by the Army wives in Fort Leavenworth, Kansas. I came home with four cookbooks in total. I just picked random ones out of her collection, and didn’t have much time to pour through them before we came back to New Jersey. While we were on the plane, I read every page of all four books. What I found filled me with such a sense of family, and even nostalgia – for things I haven’t experienced, and people I hadn’t met – and yet was connected to through my love of creating good food for my family. Over the thirty plus years of my grandfather’s military career, my grandparents were stationed at Fort Leavenworth several times, and my mother has fond memories of growing up on the base there. This cookbook is filled with the heart and soul of military wives. 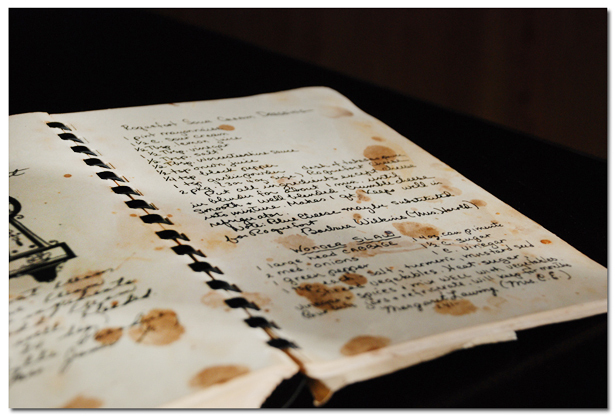 Each recipe has been handwritten by the woman that submitted it. Many of them identify themselves both by their given names, and their married names – Mrs. Smith, etc. These are women who defined themselves in the pride they have for their husband, and the service they as a family were doing for the country. I found so much honor and love as I poured through the pages looking for ideas for this blog. The grey book here, much to my elated surprise, is an V.F.W. compilation published in the 1940s, when my grandfather was just a teenager. When I opened the first page, I was delighted by the retro advertisements at the very front of the book. I felt like I was stepping back in time. 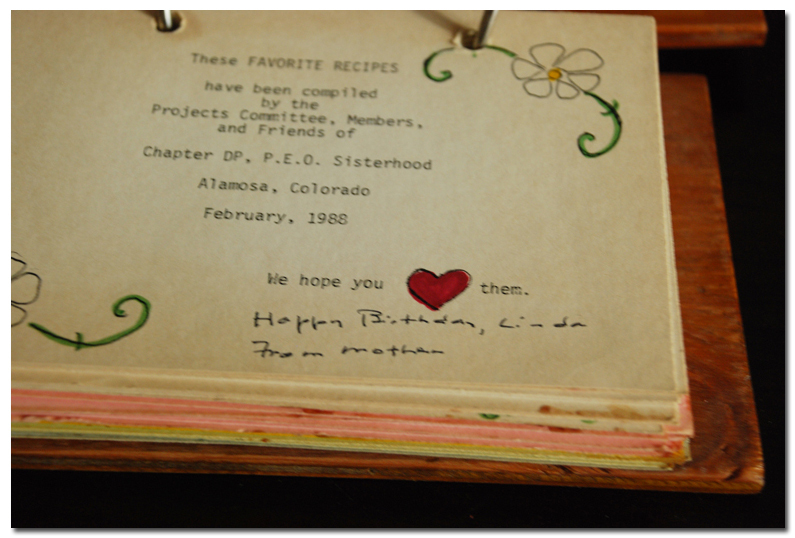 This lovely little book was put together by women in Alamosa, Colorado, which is not far from Monte Vista. Despite their less than stellar relations, this book was a gift to my grandmother from her mother, for her birthday. I find this little book quite charming and ingenious. It was produced on a typewriter, with five different colored index cards. 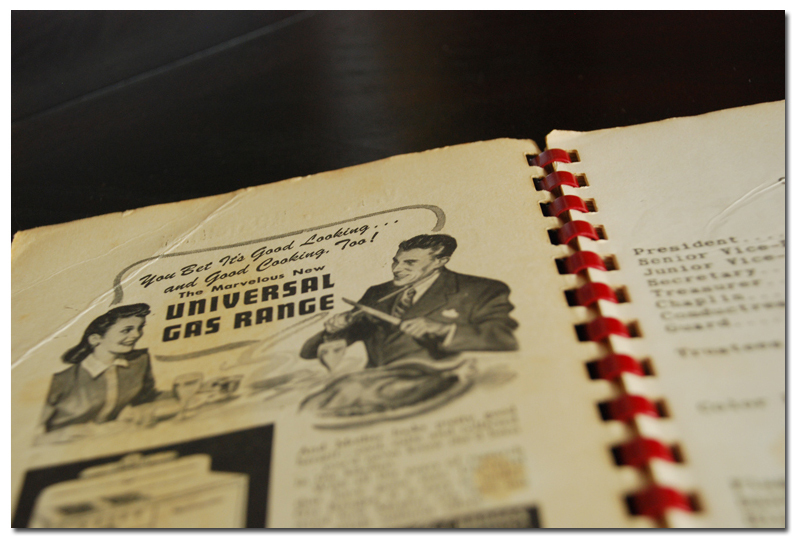 The sections of the book are divided by the colors, and includes everything from appetizers to casseroles, and of course, desserts. 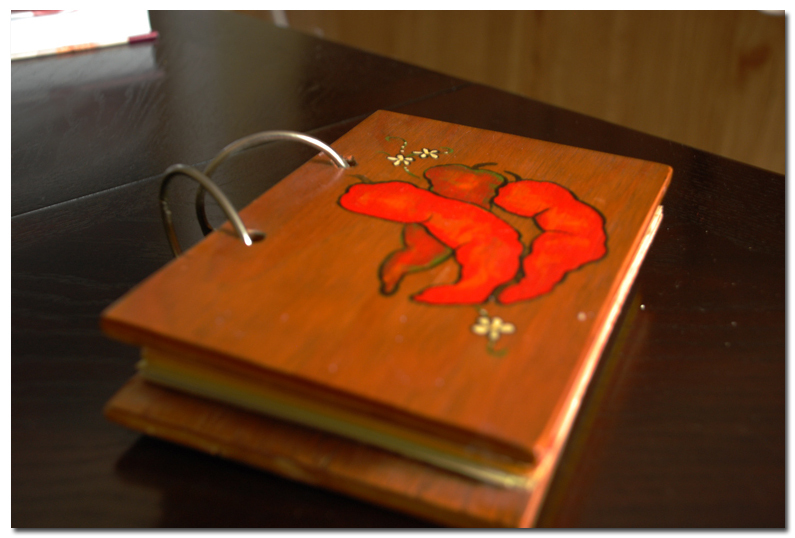 The cover is hand painted wood, and I imagine they probably had a couple of different designs. That is the beginning handwriting of one Bluebonnets and Brownies blog author, folks. I can’t even begin to imagine what I was trying to write, but I’m almost certain this little stunt warranted a wooden spoon to my backside. And now, because I promised my grandmother I would, I am sharing with you her very favorite recipe from this book. It’s from the pages that are so very work-stained. 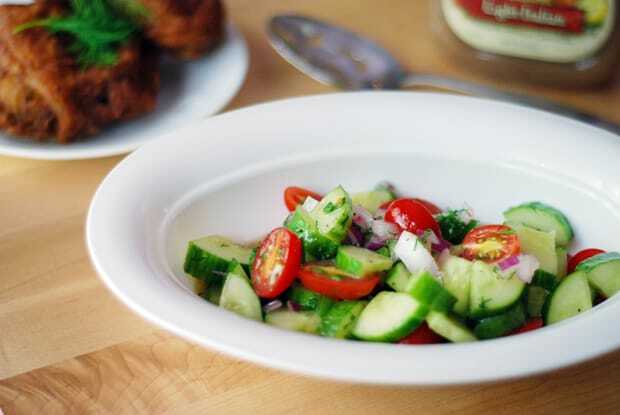 Nearly every week, she makes this recipe for Roquefort Sour Cream dressing (or.. you know, Blue cheese), because my family devours it in their weekly lunches at her house. I hope that you enjoy it as much as we do. And I should mention that while I get to keep all the other books I absconded with back from Texas, this little ruby darling must be shipped back to her owner for fear of my own life. Yes, the recipe is that good. Put all ingredients except cheese in blender for about 1 minute until smooth and well blended. Crumble cheese into mixture. Makes 1 quart. Keeps well in the refrigerator. Note: Blue Cheese may be substituted for Roquefort. I was tweeting you from the mcdonalds line. Now im parked in the parking lot bawling, but good happy tears because I know this kind of love. Those cookbooks are more valuable than anything in the world. Priceless memories. I know she didn’t get angry when you wrote in her book. She laughed. Wow. I am touched beyond words. 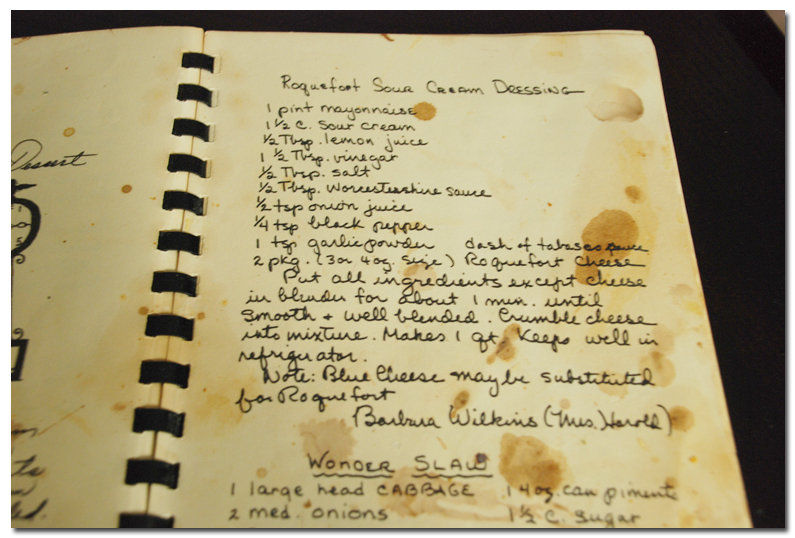 And the blue chesse dressing recipe is the same one my Nanny used. Worsterschire, tabasco, and lemon juice. Wonder where they got it, if it was all the buzz in their day. Pa…mu brothers both went to school in Golden, Co. I’ve toured that brewery many a times. Thanks for sharing. It brings bac wonderful memories. How lucky you are to have those Amber!